Nobody wants to see a police dog get hurt. That's why a Michigan manufacturer makes ballistic vests for K-9 dogs, as well as for the people who serve in the police and military. But getting cash-strapped taxpayers to foot the bill for dog vests, which run about $1,000 a piece, isn't easy. "In the K-9 unit, you sometimes feel like the redheaded stepdaughter," said Sgt. Garret Wing of the Miami Police Department. Armor Express, based in Central Lake, Mich., has produced 2,000 vests for dogs and donated 50 of them to local K-9 units. Its biggest customer for the doggie vests is a non-profit called Vested Interest in K-9, founded in 2009 by dog lover Sandy Marcal, an accountant from Taunton, Mass. "There are 30,000 K-9s in the U.S., and our goal is to vest them all," she said. Marcal said her organization, which is backed in part by flea and tick medicine maker PetArmor, has donated 1,050 K-9 vests to police departments around the country. A recent fundraiser commemorating Rocco, a K-9 stabbed to death in Pittsburgh in January, raised enough money to buy another 175 vests. Miami PD's Wing said that only two of the 17 dogs in his city's K-9 unit have vests, but they're about to get a dozen more from Vested Interest. Armor Express CEO Matt Davis employs 135 workers and has sold 265,000 vests (mostly for humans) since the company's inception in 2005. He's so confident in his vests that he actually shoots himself while wearing one in several YouTube videos to demonstrate how effective they are. 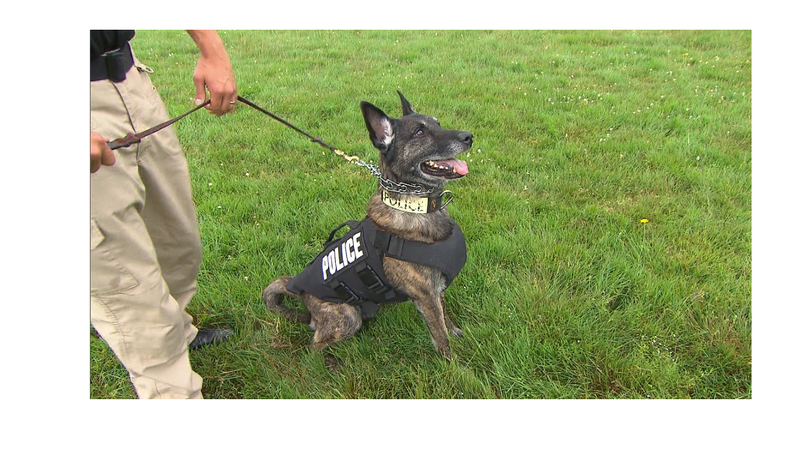 Cops from Binghamton, New York and neighboring Johnson City rely entirely on Vested Interest for their dog armor. Johnson City patrolman Brian Berdine said a vest protected his Dutch Shepherd CJ when the K-9 was attacked last year at a college football game that erupted into a drunken riot. "A glass bottle smashed on his side, but it didn't hurt him," he said. Officers who work with K-9s view them as equals, worthy of the same status as humans. But not everyone agrees. Miami's Sgt. Wing said a convict who shot a K-9 back in 2000 was sentenced to life in prison for attempting to murder a human cop, but only got five years for killing the dog. "I think it's inexcusable that a violent criminal would only get a five-year sentence for purposefully shooting and killing a police K-9 dog," he said. "Of course I am biased because I love my K-9 partner Thor as if he was my human son."